MapleStory, the blockbuster Korean MMO game, has turned up on more platforms than just the PC. It's on the Nintendo DS, for example! It's also available on Apple's iOS platforms. There are two MapleStory games on the iPhone, but today we're looking at the original, MapleStory: Thief Edition. Why? Because I just picked it up for free, that's why. 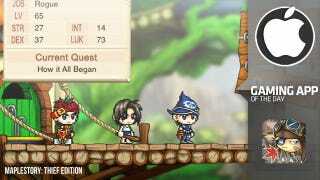 MapleStory is a 2D side-scrolling action/RPG on the PC, and that's what MapleStory: Thief Edition is on iPhone as well. You play as a young, brash boy who wants to grow up to be the best thief in the world. And you're going to help him do just that. Not by sneaking around and stealing things, though. Instead, you're going to be running around doing basic fetch quests and whacking things with swords until they give you coins. You see, MapleStory is not known for its deep narrative or innovative gameplay. It's a cute game that nails the fundamentals of exploration and loot-accumulation, layers a cute art style over the top and just puts it out there. Take it or leave it. On the PC, I can leave it, but on the iPhone, a platform still woefully short on quality role-playing experiences, it's not too bad! The vibrant colours and pixel art style look great, and the game also has a surprisingly humorous charm, so as long as you know you're getting yourself into a bare-bones RPG (almost no story or context for your repetitive actions), you'll do just fine. MapleStory: Thief Edition was free at time of posting. Its successor, MapleStory: Cygnus Knights Edition, is also on sale, down from $4.99 to $0.99.